Are you new to Sage? 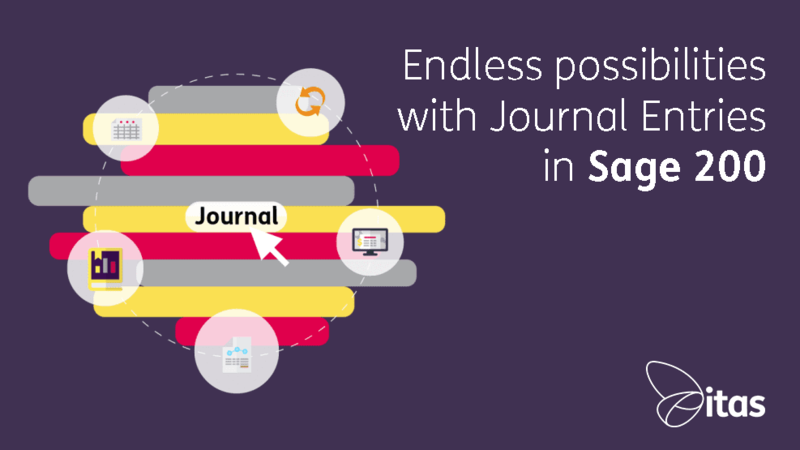 If so, you may not be 100% sure what Journals do within Sage. But never fear, this blog is going to explain what you use Journals for and the types of journals you can enter. So, journals enable you to transfer values between nominal accounts and allow you to record the movement. There must always be a minimum of two lines in a journal – one a credit and one a debit, this is because a journal must balance. One thing to remember is that you should never move values between Control Accounts. This can lead to balancing issues within your accounts and you won’t be able to reconcile. 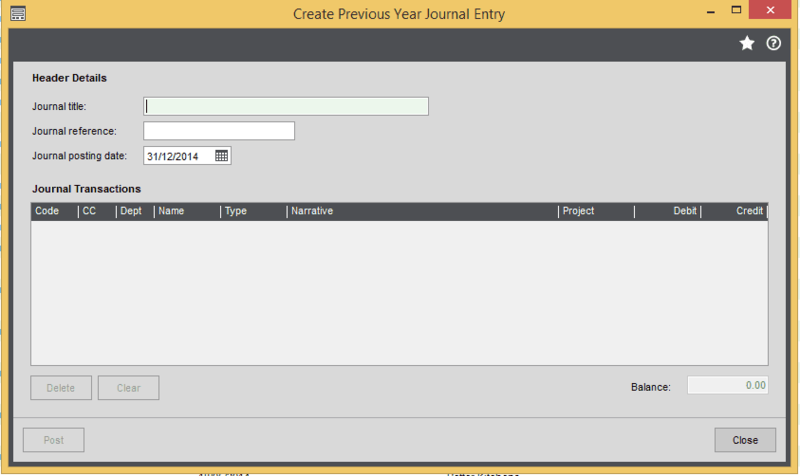 Within the Journal Entry screen you can post a single entry, reversing entry and a recurring entry. Single Entry – Posting a journal on the date specified. Reversing Entry – This is used when a journal is to be posted on a certain date, and then reversed out at a later date. This is often used when making accruals. The reversal of the journal is reversed on the reversal date (if the accounting period is set to future the posting will go to deferred postings). Recurring Entry – Able to post a journal for a number of different periods. The postings will have to be identical and the posting dates can be recurred on any number of times on dates that you can specify. Once you’ve selected the journal entry you require, you then have the choice (only if the “Allow additional transaction analysis” option is ticked within Nominal Ledger Settings) to select which Transaction Analysis codes you want to add on each item. If you have never used Analysis Codes, click here to listen to our 5 Awesome Uses of Analysis Codes in Sage 200 podcast. If your Journal includes tax, you can add this in using the drop down menu under the VAT Type column. As default, N/A is selected so make sure you check this field if you need to include VAT. You can then choose from your set VAT Codes in the drop down list. 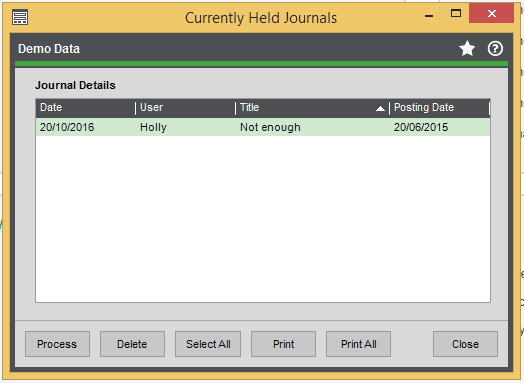 There is an option for you to place journals on hold without making the postings. And when you are ready, you are able to view these journals by going to Nominal Ledger > Enter Transactions and choose held journals. From this window, you can process or delete selected journals. When you process a Journal, it will take you to the Create Journal Entry screen which is the original screen that you entered the journal in. When you delete a Journal from the Held Journals screen, it removes it from the list. If you find yourself entering lots of similar journals, to make life easier, you are able to set up Journal Templates. You can have up to 99 Journal Templates set up on your system and there are 3 template types you can choose from. Accounts Only – On this template you are able to specify the nominal codes as a list. 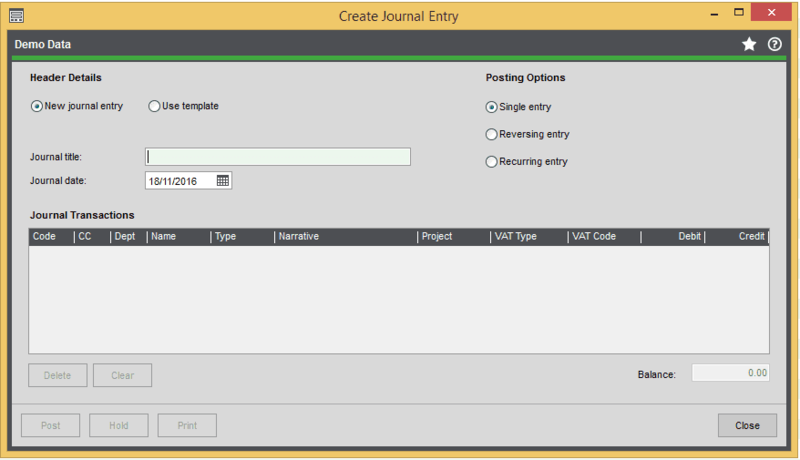 You will need to enter the values yourself when you have selected the template in the Journal Entry Screen. Value – Using this option allows you to enter amounts for selected nominal codes. You can also amend the values for this when in the Journal Entry Screen. Percentage – In the debit and credit columns, you will need to enter in the percentages for each of the postings you will require. The totals for each of the columns must equal 100%. From the Create Journal Entry screen, you can select the Use Template option and choose from the drop down list. Once these have been selected, you can change the items and enter the appropriate amounts. You are able to close the Nominal Ledger at year end, but make postings which affect the balances of previous years. What’s affected when you post the Prior Year Journal? If you would like more information on how to create your own financial statement layouts, check out our guide here. Hopefully now you know a little bit more about Journals! However, if you need any more information we are always happy to help!